Miniature donkeys are native to the Mediterranean islands of Sicily and Sardinia. They are identified as either Sicilian or Sardinian donkeys according to their ancestry, although the two types do not differ. They have been extensively bred with each other and with animals of unidentified ancestry in the United States to produce a distinctively American breed of donkeys, which we call the Miniature Mediterranean Donkey. According to all information that can be aquired these donkeys are nearly extinct in the land of their origin and have been brought to their current state of being an excellent breed by breeders in the United States who have bred for years for size, disposition and conformation. There are probably about 10,000 of these donkeys in the United States today but there is not an accurate account of them because they are not all registered. A registry was established in 1958 by Danby Farm in Nebraska and is now a part of the American Donkey and Mule Society in Denton, Texas. Approximately 15,000 of these donkeys have been registered since the inception of the registry but many more exist in unregistered herds. The breed is defined by size. The adult miniature donkey must not be more than 36 inches tall when mature, measured from the highest point of the withers to the ground. The Miniature Mediterranean Donkey is by nature one of the friendliest and most affectionate animals of its type. They are very tame and gentle. They are also easier to manage in everyday life than some donkeys simply because they are smaller. They love their owners and seek attention. They do this with friendly nudges and brays and funny little sounds designed to get you to pay attention to them. The miniature donkey is extremely intelligent and docile and is easily trained. Geldings or jennets make the best pets. Jacks enjoy braying and may become excited in the presence of the females. The size of these donkeys varies from 26 inches, which is considered extraordinarily small, to 36 inches at the withers. An average height would be about 33-34 inches. In general the smaller the donkey the more valuable it is accounted to be. Other things that make a donkey valuable are good body and leg conformation and one of the more unusual colors such as spotted, white, sorrel, "chocolate" (dark brown) or black. Gray-dun, the various shades of gray with the dorsal stripe and cross is the most common color of these donkeys. Conformation of the animals is supposed to be that of a small, compact, well rounded animal standing on four straight strong legs with all parts in symmetry and balance. 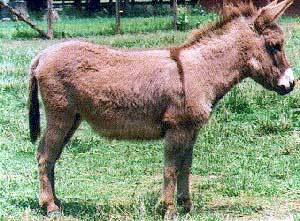 The average donkey will weigh from 250 to 450 pounds with most animals being in the lower weight ranges. The hair ranges from flat to curly to long and shaggy and in texture from smooth to wiry. The hair coat is shed out much later in the summer than that of the horse and serves to protect the donkey from the weather and the flies. Almost all of these donkeys will have a "cross". The cross is a dorsal stripe of darker hair down the length of the back crossed by a shoulder stripe across the top of the body at the withers and showing down the shoulders. Most of the donkeys will have darker markings on the ears, the tip of the tail and around the feet. Some have "Garters" or stripes ringing the legs as well. A few of the donkeys have "collar button" markings, which are dots of black hair on the neck just below the place where the head joins the neck. The registry calls a donkey the color of the body and assumes a lighter colored nose, belly and inside of the legs. If the animal has a dark nose and/or belly that is noted on the registration certificate. A dark nose is called "dark muzzle" and if no parts of the body show the light "points" the donkey is said to have "no light points". The dark points are found in all donkeys but are not too common, the light points being the norm. Life expectancy for well cared for miniature donkeys is around 30-35 years so they are truly a lifetime pet.